One major problem with menopause that women have to face is that there are so many side effects, such as hot flashes, night sweating, irritability, mood swings and others, that taking a pill for each of them is highly impractical. This is where natural supplements can rush to women’s aid, as they combine the power of natural, organic ingredients to supply users with everything is needed to combat such nasty manifestations of the hormonal shift. However, not all supplements are the same, and some are better than others. 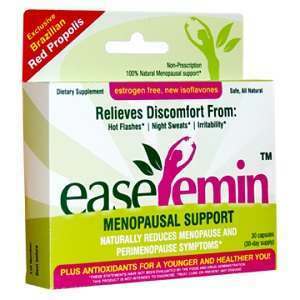 EaseFemin Natura Nectar is one menopause treatment advertised as being able to combat all the unpleasant side effects of menopause. Here is more info on the product. What Does EaseFemin™ Natura Nectar Contain? As you can see, no clear information is given on the exact ingredients. The manufacturer works with proprietary ingredients, obtained mainly from Brazilian Red Propolis, and the secrecy is quite high. We notice that the product has a good balance of phytoestrogens, antioxidants, herbal extracts and vitamins. However, the fact that the exact formula is not disclosed may put some people off. The recommended dosage for EaseFemin™ Natura Nectar is just one pill daily. A package with 30 pills costs 30.99USD, which is reasonable for one month supply. The manufacturer offers returns only on unopened packages, so be aware of such details when purchasing. EaseFemin™ Natura Nectar represents a good balance of phytonutrients and antioxidants, but it may not be as efficient as advertised. It does not contain ammonium succinate, a must have in any menopause treatment supplement, and the exact formula is not disclosed. The fact that a single pill must be taken daily is convenient, but, in the same time, it means that it cannot address both day and night discomforts. Jackie Horowitz	reviewed EaseFemin	on September 12th	 and gave it a rating of 2.